On Saturday 1st September at Nose Hill parkrun in Calgary, Alberta, we celebrated 2 years of having this free, timed, 5k weekly event. Each event has a number, it adds up each week and is displayed on the website under results history. The fact that we were at 101 and not 104 (for 2 years) made me reflect on our ability to keep this going through the ice/snow/extreme cold/smoke and any other variable weather conditions that Calgary can throw at us! We have in fact only had to cancel 4 times in 2 years (extreme cold and snow -30C with windchill, extreme cold and snow -40C, ‘snowmaggedon’, and lightning). We were also able to stage an extra parkrun on New Year’s day this year so that brought the number of events back up by one. “Nose Hill parkrun started on 3rd September 2016. Since then 1,093 participants have completed 4,045 parkruns covering a total distance of 20,225 km, including 818 new Personal Bests”. 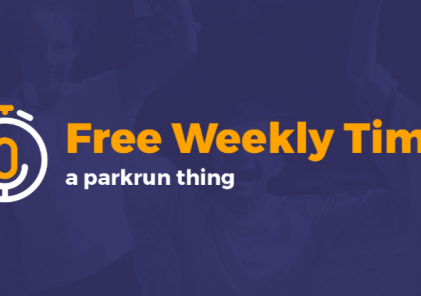 Being able to review your own times and statistics each week is one of the most motivating aspects about parkrun. It takes persistence and determination to build your volunteer credits and run credits to the milestones: 25 for volunteering, 10 for children under 18, for adult runs/walks the milestones are 50, 100, 250 and 500. The parkrun global network of events is steadily growing and participants can use their free barcode to attend any event in the world. As a result of this each week in Calgary, we have a significant number of “parkrun tourists” attend who love to have their picture taken with the Canada flag or with Downtown Calgary and the Rockies in the background. They bring a wealth of gratitude and enthusiasm to each event and help us to feel like one big global community, especially when they wear their parkrun clothing. Some parkrun tourists have even re-routed their flights to get here. Once you are truly hooked, you too will start researching if there is a parkrun close whenever you travel. Once you are totally addicted, you may immigrate to a new country and if there is no parkrun there you may even set one up, as I did. Of course I could not have done it on my own and I really have to thank all of our fantastic volunteers and those behind the scenes who give their tireless support, including Euan Bowman (Canada parkrun Manager) and those in the UK headquarters at parkrun.com. I wonder what the statistics will say in another 2 years…..